For eleven years he hosted one of the most popular art shows on television — transforming a blank canvas to a finished painting in a remarkably short, 30 minutes. He captivated audiences with his mesmerizing voice and relaxed demeanor, and of course, his signature perm. Nearly twenty-five years after his death, the painter of “happy little trees” is immortalized through internet memes, inspirational quotes, a thriving business in his name, and reruns of his show The Joy of Painting. His fame as a pop-culture icon shows no sign of diminishing yet so little is known about his life. Today on Biographics, we piece together the world of Bob Ross — beyond the canvas. Bob Ross was fiercely private and never revealed details of his personal life. He gave very few interviews — claiming no one bothered to ask him. Looking for answers is especially difficult considering no official biography of his life exists from primary sources. The one documentary, “Bob Ross: The Happy Painter” can only be obtained by pledging money to PBS, or getting a hold of a DVD. The book, Happy Clouds, Happy Trees: The Bob Ross Phenomenon, admitted that their “text is… about an understanding we have of Bob Ross and his life. If we had wanted to write an accurate biographical book on Bob Ross, that goal would be difficult to accomplish.” Adding to the elusive Ross; he was said to have very few friends and they, out of respect, only ever conducted interviews for the aforementioned documentary that is not readily or widely available. Robert (Bob) Norman Ross was born on October 29, 1942 in Daytona Beach, Florida to Jack, a builder and carpenter, and Ollie, a waitress. When Ross was just a year and a half old his parents divorced and Ross moved to Orlando. Not much is known of Ross’ childhood in Orlando — save for two defining moments. As a freshman in high school, Ross dropped out to work as a carpenter alongside his father. Around the same time, Ross suffered an accident, losing the tip of his left index finger on a saw blade. Ross must have been self-conscious of his deformed hand for the rest of his life. On his hit television show The Joy of Painting, Ross carefully disguised it — holding his paint palette so it remained shielded from view most of the time. Bob Ross married twice during his life and had three sons. He married his first wife Lynda Brown early on in his military career and they divorced in 1981. The couple had two sons, Bob Jr. and Steven. Steven would follow in his father’s footsteps and become a certified Bob Ross painting instructor. Ross’ second wife Jane, was a civilian in Alaska. They had one son, Morgan, who would also become an accomplished artist. Sadly, Jane died from cancer in 1993 and Ross did not remarry. Long before his time on public television, Ross was in the military. At the age of 18 Ross joined the United States Air Force and within a few years he was uprooted from his native Florida and sent to an entirely unfamiliar place — Fairbanks, Alaska. Ross spent the next twenty years of his life in Alaska — working, raising a family, and developing a love for painting amid the majestic mountains, towering pines, and crystal clear waters. Examining Ross’ paintings over his lifetime, one can see without question, the trees, peaks, valleys and streams are distinctly Alaskan. For anyone who has watched Ross on The Joy of Painting, the image of him as the authoritative, military figure couldn’t be further from his television personality. Apparently, Ross yelled so much during his military career he never wanted to raise his voice again after he left the Air Force. Ross’ first brush with painting occurred at an art class at the Anchorage U.S.O. club but he clashed with his abstract-loving instructors. According to Ross, they failed to teach him the practical techniques of how to paint. “They’d tell you what makes a tree, but they wouldn’t tell you how to paint a tree.” Fortunately, the experience didn’t turn him away from painting altogether. Ross soon found a more suitable painting instructor on public television. Bob Ross at ease in front of his easel. Ross’ predecessor was an older, German painter named Bill Alexander. He hosted a half-hour instructional painting show, The Magic of Oil Painting, on PBS. Watching the show, Ross learned how to paint in the alla prima style (Italian for “first attempt”), also known in the art world as “wet-on-wet.” Ross perfected the technique — which allowed him to complete a finished work in a single session. Unlike other painting methods, when an artist uses alla prima, he or she can add wet paint in layers without waiting for the paint to fully dry. Alexander falsely claimed to have invented the style but it actually dates back to the fifteenth century in Flanders (modern-day Belgium). Alla Prima was popular with many famous artists throughout history but enjoyed great fanfare among the Impressionist painters in the nineteenth century. Notably, it was a favorite technique of artists Claude Monet and John Singer Sargent. After further honing his skills, Ross decided to supplement his Air Force pay by selling landscapes painted on the inside of gold prospecting pans to tourists. It was a lucrative endeavor and when his earnings from paintings surpassed his military salary, he resigned to become a full-time artist. Don’t be afraid to go out on a limb, because that’s where the fruit is. Upon leaving the Air Force, Ross returned to Florida and sought out Bill Alexander to perfect his painting skills. By that time, Alexander taught art classes in his spare time and happily took the eager Ross under his wing. Alexander didn’t realize Ross would later take everything he knew from these lessons, make his own show, and rise to the level of superstardom — which eventually led to their falling out. During their early meeting, Alexander was impressed with Ross and he hired him as a traveling tutor for the Alexander Magic Art Supplies Company. At the same time, nine hundred miles away from Alexander’s studio in Clearwater, Florida, a woman named Annette Kowalski was experiencing a debilitating depression after losing her oldest son in a traffic accident. Unable to get up, she laid in bed all day watching television episodes of The Magic of Oil Painting. Desperate and hoping to cheer his wife up, Walter Kowalski signed Annette up for a five-day painting class with Alexander…or so she thought. Before Annette’s arrival, Alexander had passed on his classes to an unknown instructor known simply as Bob. Annette was incredibly disappointed when she heard Alexander was not longer instructing, but Walter insisted she go anyway saying, “Get in the Car. We’re going.” Over the course of the five day painting class whatever misgivings Annette first had about Ross completely disappeared. In fact, taking that class, she recognized there was something very special about him. Looking back years later Annette said, “I was so mesmerized by Bob. “Somehow, he lifted me up out of that depression….I just think that Bob knew how to woo people.” Wooing people was Ross’ calling card. Annette was on to something and saw in Ross an opportunity to “put it in a bottle and sell it.” She believed Ross was capable of making a fortune and she wanted in. After the class, Annette and her husband took Ross out to dinner and brokered a business deal. From that point on, Annette became Ross’ manager — sinking her entire life savings into the partnership. Ross and his wife ponied up a similar amount of capital. As manager, Annette focused on taking out ads in the local papers and setting up painting seminars at various malls. She even established a toll-free telephone hotline, 1-800-BOB-ROSS. But for people to really connect and experience the allure of Bob Ross, she needed to get him in front of as many people as possible. They filmed a commercial, and possibly a pilot television show to sell to PBS executives. Eventually, all the hard work and hustle paid off and Ross landed his own show on the network, The Joy of Painting. The first episode aired on January 11, 1983. The Joy of Painting enjoyed an eleven year run on PBS from 1983 to 1994, filming 403 episodes in total. During the 30 minutes of airtime for each show, Ross stood in a dark room with a blank canvas and painted an imaginary landscape scene. There were two cameras for the program, shot in real-time — a medium shot of Ross and his canvas, and a close-up shot of the canvas or palette. Ross faithfully instructed oil painting to viewers at home in the alla prima style — the same technique he previously learned from Bill Alexander. With little more than smudges, blotches, and scrapes from his palette knife, Ross created masterpieces. To keep the lessons inexpensive for people, the tools and color selection was limited. Though he surely had the technique down, Ross’ real draw for audiences was his calming presence, slower-paced speech, warm voice, and words of encouragement sprinkled in while instructing. In this way, Ross is often compared to Fred Rogers, the iconic children’s show host of Mister Rogers Neighborhood. Gotta have opposites dark and light, light and dark in painting. The Joy of Painting was like a personal art lesson, described by his manager Annette as “liquid tranquilizer.” Yet amazingly, only about 10 percent of viewers painted along with Ross. The other 90 percent tuned in to simply watch him. Ross worked quickly to create his masterpieces — swirling the paint around, dabbing it here and there — and grabbing for his two-inch brush every now and then saying, “Now, let’s get crazy.” He made the whole process of painting look completely effortless. The truth is, Ross was meticulous and his manager Annette referred to him as a “tyrant.” Ross was not mean or nasty according to Annette but he was every bit a businessman as he was a painter. He wanted everything on the show to be perfect and done his way. Before filming each episode, Ross would lay awake at night planning and rehearsing exactly what he would say. No one watching would ever know — Ross always appeared to be calm and free form on camera. His planning extended to more than the words he said. For each episode of The Joy of Painting, Ross didn’t complete just one painting. He always finished three. Ross painted one while filming (the one everyone saw), another was done before and sat just off-camera for Ross to use as reference, and the final painting, a more detailed work, was completed after the show and was photographed for use in Ross’ instruction books. Ross was never actually paid for appearing in any of The Joys of Painting shows on PBS. Instead, he used it to promote his teaching business — which worked spectacularly to expand interest after the first episode. The business, Bob Ross Inc., eventually grew to include paint supplies branded by Bob Ross and the company and Ross raked in millions of dollars. To further bring his brand into the spotlight, Ross occasionally appeared on talk shows and appeared in promotional gigs; some of these included MTV, The Joan Rivers Show, Phil Donahue, and as a guest at a Hank Snow country music concert at the Grand Ole Opry. The final The Joy of Painting show aired on May 17, 1994 after Ross was diagnosed with cancer. Ross’ son Steven, who made regular appearances on the show, appeared with his father on the set. Most of Ross’ image was intentionally created — except for his trademark afro. Believe it or not, his hair wasn’t even naturally curly — it was straight. Before he officially had ‘made it,’ Ross ditched his short, military crew cuts for a longer style and perm as a way to save money. Once his perm was a hallmark of the Bob Ross brand, he couldn’t bring himself to change it even though he grew to dislike it. Later, after Ross got sick from Lymphoma cancer and lost all his hair to chemotherapy treatments, he wore a wig on his show to keep up his appearance. Ross’ outfits were another carefully crafted element of his “look.” On The Joy of Painting Ross wore casual blue jeans with a button-up shirt…the top buttons were left undone to reveal a bit of chest hair. This timeless look was intended to appear “current” when PBS aired reruns of shows later on. A private man, Ross and his manager Annette told a backstory of his life that was light on biographical details. The story emphasized modest beginnings, a love of nature and animals, and philosophy that every person matters. His caring personality extended to his viewers, students, and injured animals that he took in and cared for. 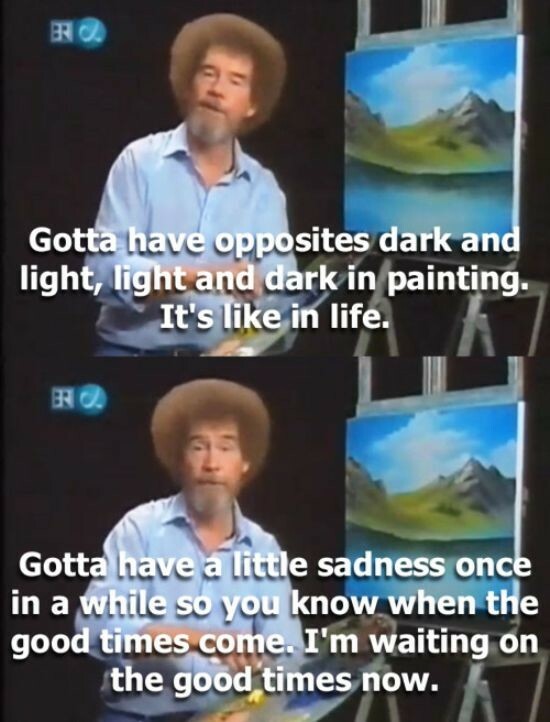 The narrative continues to be pushed today by the business, Bob Ross, Inc. In 1994, Ross was dealt a devastating blow with his diagnosis of Lymphoma, a rare type of cancer. Lymphoma is in a group of blood cancers — it attacks the lymphatic system. The lymph nodes and glands, along with a network of vessels, are an important part of the body’s circulatory functions that aid in a person’s immune system. Many people with Lymphoma never have or display symptoms, and it isn’t unknown how much Ross suffered from his disease. Bob Ross was a prolific artist, purportedly completing 30,000 paintings during his lifetime. With so many Ross paintings out in the world, it would seem relatively easy to find one and buy it to hang above the living room couch. Not true — anyone wanting to purchase one today would be hard-pressed to find an original. The reason for this being, there are so many copycat and fraudulent versions that have flooded the marketplace. And, virtually all of Ross’ paintings made on The Joy of Painting he donated to PBS fundraisers to raise money for other public broadcasting programs. Today the company, Bob Ross Inc. is going strong and is still managed by Annette and Walter Kowalski. The company sells a variety of paints, brushes, art kits, easels, canvases, instructional DVDs and books. On their website one can find and order Bob Ross branded apparel — including socks, T-shirts, and baby bibs. There are an array of accessories and wacky gifts, including coffee mugs, glasses — even a certified Bob Ross Chia Pet. Beyond the official merchandise, one can find just about anything with the Bob Ross image — a quick Google search returns a prayer candle named for ‘Saint Bob Ross.’ The company Bob Ross, Inc. still trains and certifies painting instructors who desire to work, teach, and promote themselves in the spirit of the artist. Most recently, Netflix has licensed shows, adding Ross’ series, Beauty Is Everywhere and The Joy of Painting to its lineup. In pop-culture, references to Bob Ross and his aphorisms are everywhere. His likeness and inspirational quotes live on through internet memes. Google celebrated Ross for what would have been his seventieth birthday in 2012 with an Google Doodle, an image of Ross painting the letter “g” with a landscape in the background. He has been mentioned in many popular television shows such as Family Guy and The Boondocks; Target stores carry a Bob Ross board game, Bob Ross: The Art of Chill. If all this wasn’t enough, the LEGO company has created a Bob Ross LEGO figure, complete with a paintbrush and palette. His icon status shows absolutely no signs of diminishing. It seems Ross’ legacy will never die — and his fans will continue to honor and celebrate the man for years to come. Ross once said, “Didn’t you know you had that much power? You can move mountains. You can do anything.” He showed us he could create a better place — a world filled with “happy little trees” that was free of judgement — where everyone was an artist and every landscape was full of majestic wonder.